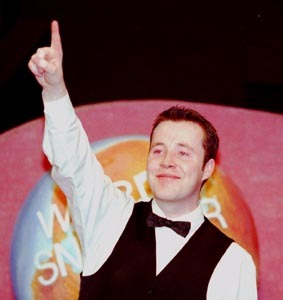 John Higgins has won his first world title by beating Ken Doherty. He finished off in style with a break of 118. The win takes him to the top of the rankings! Along the way he broke the record for most centuries in a tournament, with 14. He made four in the final alone. He shares the �,000 high break prize with Jimmy White. They both made a total clearance of 143. Higgins played brilliantly throughout, winning many frames in one visit. After the first session he lead 6-1, but Doherty refused to lie down and fought back to 6-5. Higgins once again took a commanding lead though, ending the second session 10-6 up. The defending champion struck back again, and it was pretty tight at 13-11, going into the final session. Aided by two centuries the Scot reigned supreme in the final frames though, and won the match 18-12. The crucial point in the evening session came in frame 27 when Doherty, 15-11 down, went in off after potting a frame-winning brown and allowed Higgins to clear up. Doherty also had the misfortune to go in-off in frame 29. However, Higgins was a deserved winner, even if 18-15 would have been a fairer score. 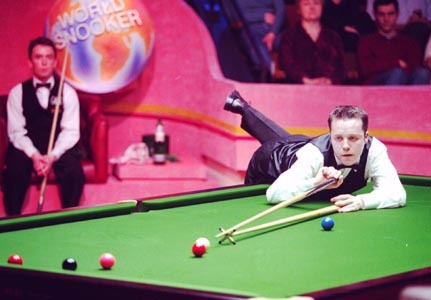 Higgins, just 13 days short of his 23rd birthday, became the third youngest champion, behind Stephen Hendry and Alex Higgins. JH, asked on what he was going to do over the next few days, "Get drunk!" JH: "Thrilled to have beaten a great champion like Ken." JH: "I know Ken put the trophy on top of his mum's television and I will do the same." KD: "He's had a fantastic season and I hope he enjoys his year as champion as much as I did." JH: "It was very hard and when Ken came back to 13-11 I thought I had lost the advantage. I just could not shake him off. But I got there in the end." JH: "I think I have played my best ever snooker over these two weeks and it is a dream come true to also get the no.1 spot." KD: "John played fantastic snooker and is a worthy champion." The Glasgow Celtic fanatic has a chance for a double celebration this weekend when his favourite team should lift their first domestic championship in 10 years. The first prize was �0,000 and Doherty received �2,000 as runner-up. Thanks to Patrick McWilliams (pmcwilliams@clio.arts.qub.ac.uk) for quotes and comments. The total of 59 is a new record for the World Championship. From William Hill, March 1998.